Bonn’s love for its native composer is evident everywhere. 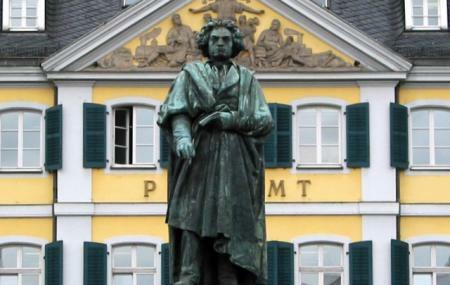 The Beethoven Statue is an expressive piece of sculpting that inspires thousands of artists visiting Bonn. Installed in 1845, the bronze statue was installed on the Münsterplatz in a ceremony attended by Friedrich Wilhelm IV and Queen Victoria. Sculpted by Ernst Julius Hähnel and Friedrich von Amerling, the monument represents the Beethoven’s significant contribution to music.The statue was cast by the Nuremberg founder Jakob Daniel Burgschmiet. A supporting concrete sculpture made by Klaus Kammerichs was unveiled in 1986. The Beethoven Monument hosts the annual three-month musical carnival every November, extended up to Ash Wednesday in February. Plan your trip to match the carnival event. Any time between November and February is suitable. Carry a camera to capture the festive mood. Food stalls and itemized shops are located around the Beethoven Monument. How popular is Beethoven Statue? People normally club together Altes Rathaus and Beethoven-Haus Museum while planning their visit to Beethoven Statue.